PRESIDENT Mnangagwa yesterday swore in Mr Kumbirai Hodzi as the country’s substantive Prosecutor General. 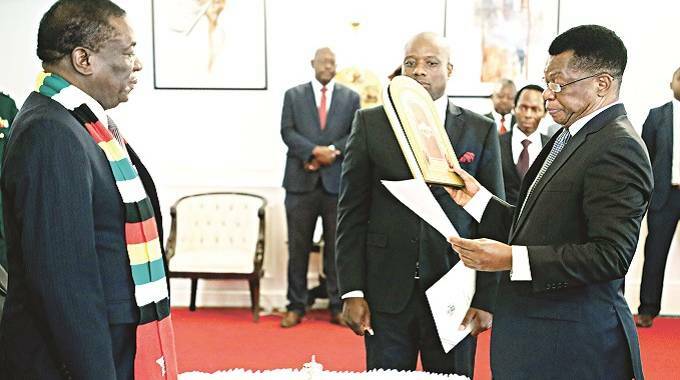 Mr Hodzi, who was Acting PG since July 24 last year, was yesterday confirmed substantive head of prosecution at a colourful ceremony held at State House in Harare. Speaking after the swearing-in ceremony, Mr Hodzi said he was geared to escalate the fight against corruption through improving the quality of the dockets and prosecution. Mr Hodzi said quality investigations and prosecution of cases was key to ensure conviction of all those who are guilty of graft. “We want to improve the quality of investigations, dockets and the prosecution of matters to ensure that the guilty are sent to jail,” said Mr Hodzi. He said his office had received corruption complaints against some magistrates and prosecutors. The cases are under investigation. “After what happened recently at Harare Magistrates Court, we received a number of complaints against magistrates and prosecutors. Investigations are already underway,” he said. Mr Hodzi vowed to unearth all the corruption cartels in the justice system which include lawyers, judicial officers and prosecutors. Vice Presidents Constantino Chiwenga and Kembo Mohadi attended the ceremony. Mr Hodzi replaced Advocate Ray Goba, who resigned mid last year. Prior to July 24, 2018, Mr Hodzi was Deputy Attorney-General in charge of the Legal Advice Section since 2012. The race for the substantive PG’s post had 10 candidates who were publicly interviewed in November last year. Mr Hodzi was among the top performers whose names were forwarded to the Presidium for appointment. The other candidates were: Mrs Noria Mashumba, Mrs Florence Ziyambi, Ms Jessie Majome, Mrs Wendy Chingeya, Justice Maphios Cheda, Mr Misheck Hogwe, Mr Tinomudaishe Chinyoka, Mr Edmund Marondedza and Mr Tichaona Mantsebo. JSC advertised the post in the press following the resignation of Adv Goba in September last year after he was suspended from office on a raft of allegations of misconduct such as failing to prosecute high-profile cases, travelling without Cabinet authority and use of abusive language. The office of the PG has become a hot seat, with two previous prosecutor-generals having been fired for misconduct. Adv Goba was the third PG to leave office in recent times. The first to be removed from office was former Attorney-General Mr Sobusa Gula-Ndebele in May 2008, who doubled as head of criminal prosecution and civil litigation. He was fired for conducting himself in a manner inconsistent with public office. Mr Gula-Ndebele was succeeded by Mr Johannes Tomana, who was also removed from office last year after a tribunal found him to be grossly incompetent in the execution of his duties. Mr Hodzi is an experienced lawyer of 34 years, who has practiced law in different capacities and served as a magistrate for years. He was also a prosecutor and law officer for many years and was once attached to the Criminal Tribunal. Mr Hodzi practiced as a solicitor in the United Kingdom and also served as a law lecturer, legal proctor and chairperson of the Legal Advice Clinic.